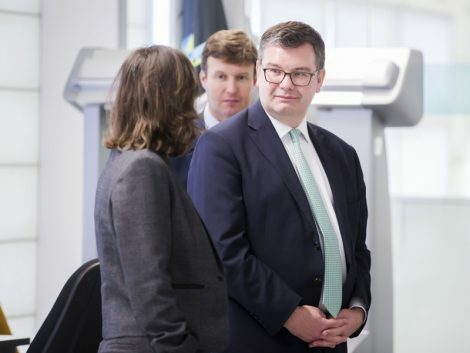 Milton Keynes South MP Iain Stewart has added to Parliament’s support for the Silverstone Technology Cluster. Iain was a recent visitor to Silverstone Park where he met its Commercial Director Roz Bird – also an STC Board Director who briefed him on the Cluster’s purpose and success in promoting the region as a ‘mecca’ for high-tech business and manufacturing which can benefit UK plc. They were joined by Stuart Pringle, Chairman of the British Racing Drivers Club which owns the neighbouring Silverstone Grand Prix circuit. “I was impressed with the breadth of businesses operating in the Silverstone Technology Cluster,” commented Iain. “There is scope for great economic growth along this part of the Corridor. Iain is the latest MP to visit Silverstone Park and hear about development of the estate and the Cluster – others have included Penny Mordaunt (Secretary of State for International Development and Minister for Women & Equalities), Andrea Leadsom (South Northants MP & Leader of the House), Andrew Lewer (Northampton South) and Chris Heaton-Harris (Daventry).